Did you hear about this recent study? Undertaken in a collaboration between a public health professor and an economics professor, the study of 80,000 people in the U.K. found that happiness and mental well-being rose with the number of servings of vegetables and fruits eaten per day, topping out at seven. That means if you’d like to feel happier and less anxious and you eat less than seven 3-ounce servings of produce each day, just eat more of them. 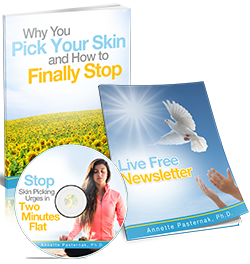 And if you are less anxious and less depressed, chances are good that you’ll pick your skin less too. Study authors are both surprised that the effect of vegetables and fruits was so large. However, I am not, and I’m sure most other holistic health practitioners are not surprised either. It’s about time more large-scale scientific research is done on the effects of food on physical and mental health, and that diet and lifestyle changes become a first-line response to chronic illness alongside pharmaceutical drugs. We all know we ought to be eating our vegetables, but motivating to make these kind of positive changes is another story. 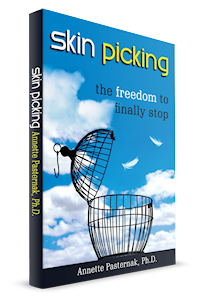 If you, like most of us, need a nudge to get moving, read about my coaching programs to stop skin picking and other body-focused repetitive behaviors (BFRBs).